Mobile technology works well with consumers’ busy lives, and now it’s expected to help them stay well throughout their lives. This was the focus of a new report conducted by The Economist called, “Power to the Patient: How Mobile Technology Is Transforming Healthcare.” It made the case for how mobile technology is poised to change healthcare by adapting how care is administered and accessed over the next few years. According to industry experts, mobile will improve healthcare outcomes, lower costs, and help underserved communities receive the care they need. And mobile may advance medicine by providing access to big data to allow for better care. Yet with all this momentum mounting for mobile, it’s important for healthcare professionals to understand how it’s viewed and valued. To discover how mobile technology could breathe new life into healthcare, review these revelations that were dispensed in the report. 79% of professionals said that mobile technologies are offering people more information and education about their health issues. 64% thought that mobile’s ability to provide greater access to health information could significantly improve medical outcomes. 62% believed that mobile would let patients make better healthcare decisions by giving them greater access to their personal information. Around half anticipated that mobile would allow people to be more proactive in their health decisions over the next five years. Mobile is made for connecting people, so it could greatly help people in need connect to the healthcare they need. This concept has been tested worldwide over the last few years and the results are simply staggering. In the U.S., home monitors were given to 50 people with chronic illnesses and each patient was closely supervised and given health advice as needed. This resulted in these patients greatly reducing the length of their hospital stays and saving more than $90,000 per patient. China has struggled to deliver adequate healthcare to rural residents. But in a recent program, 11,000 heart patients were given smartphone-enabled heart sensors that sent patient data to doctors who contacted patients by phone or text to respond to their medical needs. The program proved mobile could make medical care more accessible to anyone, anywhere. These were just two experiments, but may others share such success and show the promise of mobile in healthcare. Pharmaceutical companies have been developing mobile tools that let patients and providers monitor, manage, and medicate diseases. In fact, Merck, Bayer, and Novartis have made more than 100 healthcare apps for a wide range of conditions. Pharma brands understand that mobile health technologies can ease the patient experience while improving outcomes and cutting costs. Yet there have challenges along the way, such as slow adoption of apps due to lack of patient trust. The cure for this concern is for pharmaceutical companies to develop useful mobile tools that prove that they’re reliable sources of healthcare information. According to the report, almost 80% of respondents said a primary goal of mobile for health was providing patients with information. And in the future, they thought that mobile’s main benefits would be reducing the costs of healthcare, helping patients be pro-active in care, and enabling self-monitoring to improve health awareness. We’re making progress toward all of these goals with the new mobile wearables. Apple Watch and Fitbit are two wearable mobile devices that let people track their daily levels of health and activity. And new apps are being developed just for these mobile devices to make self-monitoring second nature. But the next challenge for healthcare is developing mobile devices that collect the kind of personal health data that allows them to replace or support professional medical equipment. Mobile healthcare technologies can also leverage big data to let doctors tailor treatments for patients and learn more about diseases. In addition, big data can ease and expedite the sharing of information between patients and providers. They can help patients research doctors and diagnoses, while allowing healthcare professionals to send medical updates to patients. 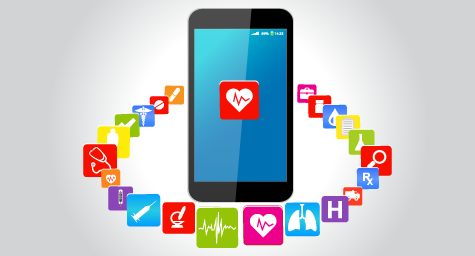 Mobile can allow patients to take control of their health. It can help them research health conditions, monitor their vital signs, conduct medical testing, diagnose diseases, and communicate with their doctors remotely. This would greatly reduce the pressure on overcrowded hospitals and decrease the need for doctor visits since many checkups could be done from home. By staying aware of their current health, patients may be able to prevent or catch conditions early and lower their medication needs. And all of these measures save costs all around. It’s easy to see how applying mobile to medical could transform the practice of healthcare. From making patients more pro-active to improving care and reducing costs, mobile health technologies can bring a world of benefits to patients and providers. Now, the health industry must focus on the future and develop ways to add mobile to their healthcare marketing strategies and to use mobile to make a medical difference. Learn the latest strategies for healthcare marketing. Contact MDG Advertising today at 561-338-7797 or visit mdgadvertising.com.